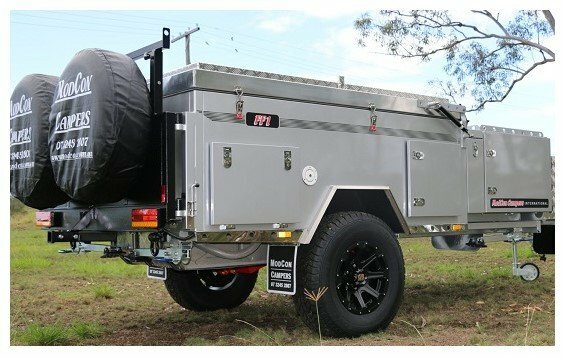 Designed around our most popular forward fold camper, the FT7 has incorporated a lot of the standard features of the FF1 but with more space inside. With the slide out extension of the canvas room, the ModCon FT7 can now have two Queen size Beds inside the main room. It’s also perfect for families that are looking for more space by incorporating a single bed behind the settee or combining the whole end to be an all bed area. Still enjoying the luxury of the main bed being a quality Queen size innerspring mattress, there is available room inside the camper to make your bed and travel from port to port without having to make the beds every night. 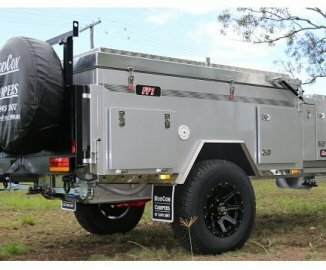 This camper tows beautifully behind your vehicle due to the ModCon designed Independent Trailing Arm Coil Suspension, with twin shock absorbers and removable stub axles, the camper travels smoothly even with a full load. The FT7 comes with new 16 x 8 Rims and tyres ensuring you can drive away and start your big trip today. Standard features include Bike Rack holder, Stainless Steel Pantry and extra H style racks for Kayaks etc. This unit is in Fantastic condition and is in as new condition. THE TRACK MATE IS A COMBINATION OF TRACK’S MILITARY HERITAGE, MIXED WITH THE MODERN DAY NEEDS OF THE OFF ROAD TOURER.